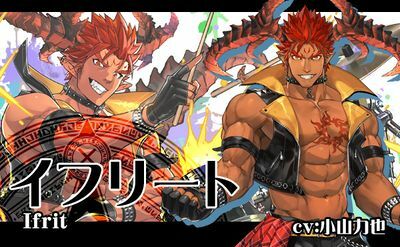 "I’m Ifrit, the flame demon. Huh, why am I wearing this?......Because I have to work off my debts of course!" Apply CS Lock to self, enemies at target. 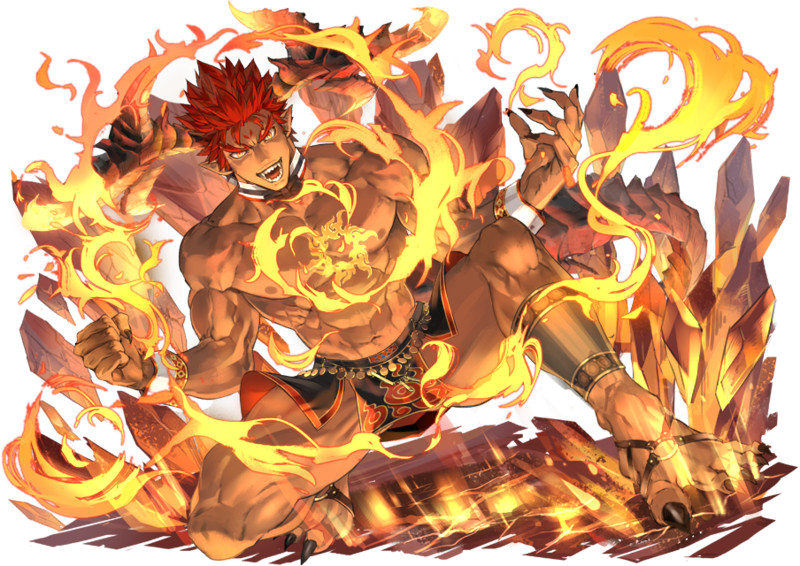 I’m Ifrit, the flame demon. Huh, why am I wearing this?...Because I have to work off my debts of course! It’s getting really hot. guests. Yeah, it’s time to get violent! Hell’s locked flames, Lemetogen Clavicula! Burn the spinal cord to ashes! Yeaaaah! I won, boss! How much has this reduced my debt?!... Hey, wait a minute! D-don’t go!! Ahh… burnt… Damn, I’m burnt out… But this isn’t over yet!! A Transient who works as a waiter and bouncer at the Tokyo Casion, run by the Roppongi Tycoons. Due to circumstances beyond his understanding, he found himself having to pay back an unimaginable amount of debt. Quick to anger and impulsive, the fact that he is both gullible and unable to maintain a poker face mean that he is very easy to deceive and terrible at gambling. To this day, he hasn't realized that he was manipulated by the Casino. He is easily moved by sad stories and is very active in the sports clubs at his school. He is especially fond of underclassmen who are just as passionate about sports as he is. A waiter and bodyguard of the Tokyo Casino run by the management of the Roppongi Tycoons. He was cheated in a game, and in order to pay off the outrageous debt he was saddled with, he works at the Tokyo Casino. As a summon he flares up quickly, is easily tricked, simple-minded and impulsive, an open book whose thoughts are written on his face right away, and terrible at dealing with tears. Naturally with a personality like that he is hopelessly unsuited for gambling, and still has not noticed he has been cheated. He constantly puts on a good showing in the school's sports club, and he holds affection for his kouhai that are giving his all. Long ago a great, ancient king pressed on his left breast leaving a ring brand, leaving Ifrit with a curse to unconditionally obey whoever he serves. This applies even in battle, and so long as the summoner does not grant permission he cannot fully display his power. Should the summoner touch the brand on Ifrit's chest and command it the seal on Ifrit's flame spouting Hallowed Artifact, his heart, can be unlocked. After unlocking the seal and dealing with enemies it will lock itself again, so it will be necessary to unlock it again every time. Heated as he is he has a surprising sense of responsibility with the disposition of a work team leader. He bears an intense anger at those who quickly slack off at work. This is my first time playing the drums, so let’s do it together, yeaaaaooouhhh!!! 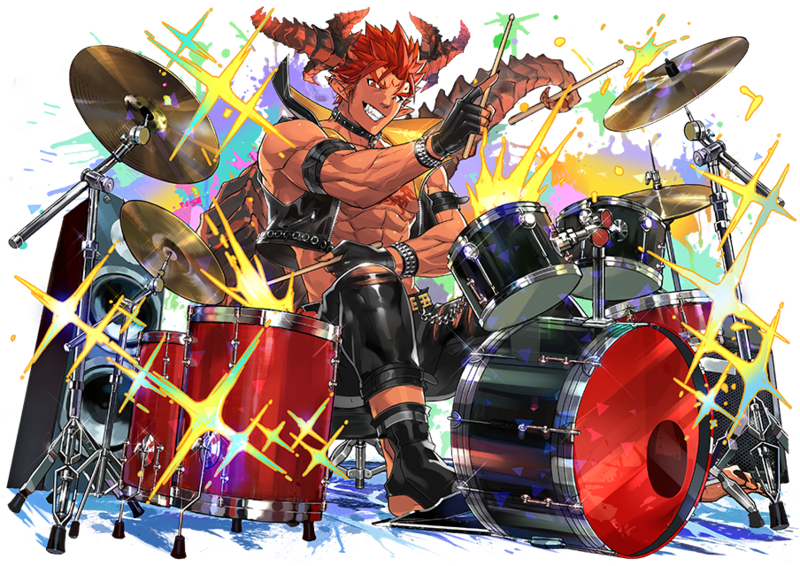 I am a drummer, the drummer of fire, Ifrit. This is my first time playing the drums, so let’s do it together, yeaaaaooouhhh!!! Listen to my drums. ‘Cause I’m gonna drop a hot beat! Roar, my burning drums, a turnaround, debts, uooooh! Burn, burn, burst into flames! Yeah, you heard my beat! Alright, let’s head for the next stage! With our drums! Set Sail! Golden Treasure Ship (9/28/18 ~ ?? ): Tokyo Afterschool Summoners. My! Drums! Will breathe out flames! After being tricked back in Tokyo, he seeks for part-time jobs to repay his debt, this time as a hot-blooded drummer. His prideful physical abilities that once were the reason to be hunt down from his birthplace are far above that of a human. This time he decided to join band activities, his natural sense of rhythm lets him persevere until the end of the songs supporting his band members from the back. His helpful personality is unexpectedly suitable. However, rumors say that his loud voice plus the drums sound can break one’s eardrums. Ifrit are infernal spirits in Arabian mythology that are said to influence the life of man in both good or evil ways. His charge skill, Lemetogen Clavicula, is likely a reference to the Lemegeton Clavicula Salomonis, a grimoire on demonology. How about that Burn debuff then? It doesn't affect enemies, only allies. I've been farming with him and I've never seen his buff go to the enemies. His radiator skill affects his allies?! "Hey buddy, I think you've got the wrong door, the leather club's two blocks down. 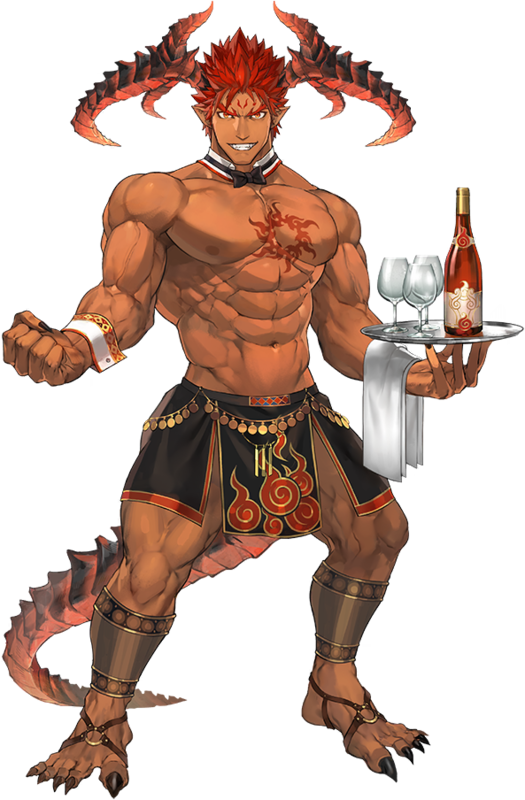 ♂"
The whole joke with him needing money and working as a waiter was funny and all but I'm so glad he finally has cool outfits, because he's a really neat looking character. I seriously doubt I’m going to get his variant, but I’ll be damned if I don’t try. Or just settle with hsi 4 star version. This page was last edited on 4 March 2019, at 22:20.